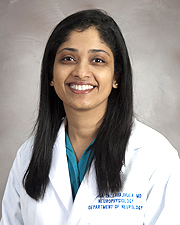 Dr. Sudha Tallavajhula is an Assistant Professor in the Departments of Neurology at McGovern Medical School at The University of Texas Health Science Center at Houston (UTHealth). She is the Medical Director of the Neurological Sleep Medicine Center at TIRR Memorial Hermann. Dr. Tallavajhula specializes in early screening, diagnosis and management of sleep apnea in acute ischemic stroke patients to facilitate recovery from stroke. She also specializes in the incorporation of sleep medicine methodology in the development of innovative tools that enhance the recovery of patients with traumatic brain injury, stroke, spinal cord injury, post-traumatic headache and other neurological conditions.